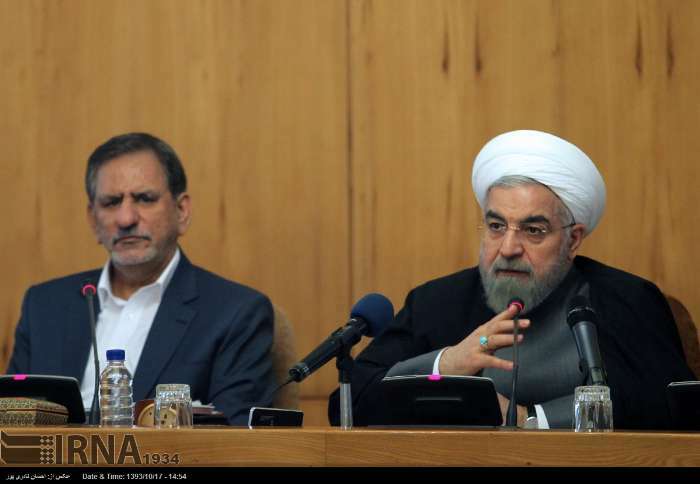 FNA – Iranian President Hassan Rouhani underlined that the country will resist against enemies’ attempts to impose their will and stand tough against any possible aggression. “The nation will stand again for its honor, independence and dignity and will not surrender to the enemy because surrendering to the enemy has no end. If our nation surrenders to the US, then it should surrender endlessly which means that we should give up our country, honor, independence and identity,” President Rouhani said, addressing a cabinet meeting in Tehran on Wednesday. “If we want to stand, we should stand from the first day and undoubtedly, our people will stand against aggression and imposition of enemies’ will,” he added. Elsewhere, Rouhani said that a trilateral meeting is due to be held among Iran, Turkey and Russia on the regional issues, specially on Syria, “which shows that our nation, government and officials make efforts for regional stability and security alongside protection of their national rights”. His remarks came two days after millions of Iranians in Tehran and other cities throughout the country poured to the streets on Monday to show their unconditional support for the Islamic Republic through staging massive rallies on February 11th, marking the 40th anniversary of the victory of the Islamic Revolution in Iran. Huge masses of people from all walks of life converged on streets and squares all over the country to express their support for the cause and ideals of the Islamic Revolution. A sum of 6,500 Iranian and foreign journalists, reporters and photographers covered the Bahman 22 (February 11) rallies this year. On this day 40 years ago, people took to the streets to celebrate the collapse of the Pahlavi Dynasty and the emergence of the new era.